Follow the steps below to set up the screensaver for your Cox Homelife touchscreen. 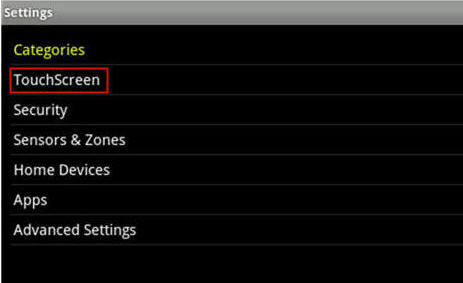 The touchscreen will not enter screensaver mode when it is armed. 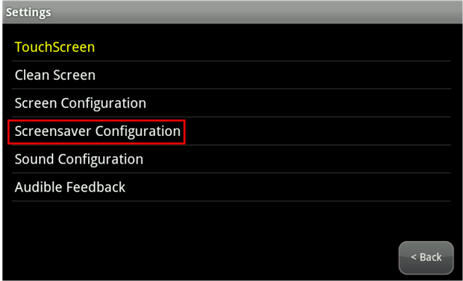 From the Touchscreen menu, tap Screensaver Configuration. 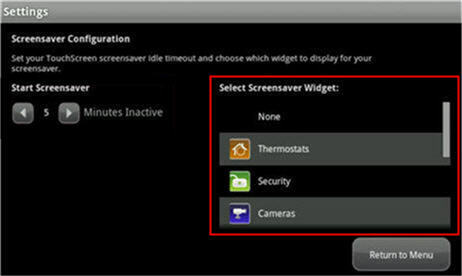 Result: The Screensaver Configuration screen displays. Tap the left Start Screensaver arrow to decrease the time elapsed before the screensaver activates. Tap the right Start Screensaver arrow to increase the time elapsed before the screensaver activates. The maximum time elapsed is 30 minutes, the minimum is 5 minutes. Scroll to see the available screensavers. Tap the screensaver that you would like to use. The table below explains the commonly used screensavers. None The screen never goes to screensaver. Security Screen displays the Arm System tab from the Security app. Camera Displays stills of the cameras attached to the security system. The stills will update every five seconds. If there is only one camera attached to the security system, a live video will display. Clock Displays the current time in digital or analog format. Blank Displays a blank screen.